(MoneyWatch) The IRS examined 1.1 percent of all individual tax returns in 2010 and 2011, so the chances that your tax return will be audited are only about 1 in 90. But the odds of an audit can increase substantially depending on your income, types of income, deduction amount and changes you have made since filing your last tax return. The IRS uses a computerized process to check all tax returns for math and clerical errors, such as incorrect Social Security numbers and addresses. If a mistake is detected, a notice of the error and a recalculation of the tax due is sent to the taxpayer. The IRS also runs tax returns through a process that compares the information you report from your bank, employer, and W-2, 1099 and other forms and documents. If you omit an item from your tax return, it's very likely to be picked up by the IRS's computers. The agency will send a computer-generated notice that includes a recalculation of your tax and the additional interest and penalties you will owe. A few newer items that can trip up some taxpayers include payments received by businesses from credit and debit cards and investors who report the sale of their investments. As for businesses who accept credit and debit card payments, those gross and monthly totals are reported to the IRS by banks and other settlement entities that process the transactions. So it's important to make sure these amounts are reported accurately on the businesses tax returns. Also, individuals who report gains from the sale of their investments should also take note that the securities industry is now reporting to the IRS the cost basis of investments that were sold as the gross proceeds from the sale. While an IRS audit is not something most sane folks want to go through, it also isn't something to be feared. If you have kept complete and accurate records of all of your deductions and have reported all of your income, you should be fine. 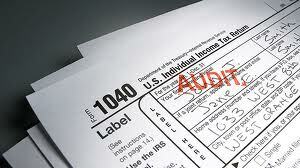 In fact, in about a quarter of audits, the IRS makes no changes or issues a refund.